Pets allowed of a combined weight limit of 50 pounds in rentals. For late arrival arrangements, please contact our Front Office at (305) 249-1036. We guarantee that the type of site that you reserved will be available. However, we do not reserve site location. Park Models/Tied Downs - One month deposit is required for new guests. Office Hours Sunday – Thursday 8 a.m. to 6 p.m. Friday – Saturday 8 a.m. to 8 p.m. Hours may vary during holidays and special events and are subject to change. Check-In/Out Time Check-in time for rentals (cottages, travel trailers, and hotels) is 4 p.m. and check-out time is 11 a.m. Check-in time for RVs is 12 noon and check-out is 11 a.m. You may request to check-out at 2 p.m. (subject to availability) for an additional fee. Advance arrangements with the registration office are required. RV guests arriving after hours must contact the registration office by 5 p.m. to make special arrangements. Late Fee Notice Late fees are charged when lot rental payments or utility payments are not paid by the 5th of the month due. After the 5th a $50 late fee will be assessed for late rent payment and/or $25 for late utility payment. Florida Statutes Guests must be in compliance with Chapter 513 and Chapter 83, Florida Statutes, in accordance with duration of their tenancy. A copy of these statutes is available in the office. Site Rules Each site is allowed: one (1) RV; maximum occupancy is six (6) people (this includes registered guests and visitors); One (1) car; and one (1) golf cart. The guest who is the reservation holder is responsible for ensuring that all materials and vehicles are contained within the site dimensions. All sites must be kept clean, tidy and free of clutter. Clutter is defined by the sole discretion of the Resort Management. Please refer to the following listing of materials allowed or prohibited at a site. All registered recreational vehicles with full hook ups only and will not accept man made RV’s. This is not to be interpreted as a fully comprehensive listing. Any questions should be addressed to Management. Permanent Structures Permanent structures are strictly prohibited. This includes but is not limited to: decks, porches, Tiki porches, patios, cabinetry, trees, bushes, plants, canopies, gazebos, outdoor kitchens, or pools. Fencing or barriers (including landscaping) is strictly prohibited. Outdoor Living Space Only customary outdoor patio/lawn furniture and accessories may be left outside within the site. Tools, toys, fishing gear and other such items must be stored within the RV or shed/cargo trailer. Larger outdoor recreational items, including but not limited to: kayaks, paddleboards, coolers, boating/diving/fishing equipment, must be organized and neatly stored beneath the RV with every attempt to conceal these stored items and maintain site aesthetic. Canopies The canopy must be collapsible; cannot exceed 10’ X 10’; and only one (1) is permitted per site. The canopy color may be a neutral color (tan, green or white) any other color requires management approval; may not bear any advertising or logos; and may not be multi-color. It may not be enclosed on all four sides; an open side must face the road. The other three sides may be enclosed with a single layer of see through windscreen. Guests/Visitors Guest is the reservation holder. Maximum occupancy at a site is six (6) people (this includes the guest and their visitors). Guests must register all visitors with the registration office prior to their arrival identifying the visitor(s) by name and period of time they will be in the Resort. Visitors are the responsibility of the guest they are visiting and are required to observe all of the Resort rules. Guests and visitors must comply with any wristband requirement. Rental of Site Guests may not rent, sublet or assign usage of their reserved site, RV or rental unit (e.g., cabana or travel trailer) or allow anyone use the site, RV or rental in their absence. Quiet Hours Quiet hours are from 10 p.m. to 8 a.m. No generators after 10 p.m. Music may be played for your enjoyment only and must be contained to your site. Violation of this rule may result in immediate removal from the Resort. Golf Carts/Motorized Vehicles One (1) electric golf cart is allowed per site. Golf carts must be registered with the office and bear a registration sticker. Drivers must possess a valid driver’s license and be at least 16 years of age. Children may not drive a golf cart, even with direct adult supervision. Golf carts are to be returned to the site by 12 midnight. Sound/music systems are prohibited on golf carts. Professionally installed working lights are required for night driving. Violation of any of these provisions is grounds for removal from the Resort by any qualified employee including security personnel. Golf carts parked illegally (including but not limited to: empty sites, beach, amenity areas, etc.) will be towed, locked and fined $50. Repeated illegal parking may result in removal from the Resort. Parking One vehicle is permitted per site provided they fit within the site dimensions and NOT ON EMPTY SITES. There can be no parking on any street per the Monroe County Fire Marshal. Any vehicle (car, golf cart, watercraft, etc.) parked illegally is subject to being towed (at owners expense), and/or locked and fined $50. Utilities The Resort shall provide utility hook-ups at the site for sewer, water and electrical service. Guests shall not make any alteration to the electric, water or sewer connections provided by the Resort. The Resort’s responsibility shall extend only to the point of connection and the Resort shall not have any responsibility for the condition or functioning of any pipes, conduits or wires from such point of connection to the guest’s RV. Wastewater must be disposed of properly; no dumping on the ground. Please use the appropriate dump station or sewer connection. The Resort reserves the right to disconnect utilities in order that repair, alterations or additions may be made. Guests will be notified, when possible, of any planned utility system shutdown. The Resort shall not be responsible for any loss suffered by any guest from planned or emergency shutdowns. Florida State Law requires the use of “donuts” to connect sewer line. The Resort is also required, by law, to have vacuum breakers (backflow preventers) on each water connection. Every site in the Resort is equipped with the proper vacuum breaker. There will be a fee charged to your account if this breaker is removed or tampered with in any way. Landscaping Guests may not landscape sites. Plants in 3 gallon pots (max.) are permitted – maximum of 4 pots per site. Potted plants cannot be used as a barrier. Management reserves the right of access to all sites at any time and to have overgrown or unsightly sites cleaned up at guest’s expense. Trees and plant life are not to be defaced, cut or damaged (this includes affixing materials to trees). Pets No more than two (2) common household pets must be a combined weight of 50 pounds,(e.g., cats and dogs) may be kept on any site. No other animals, livestock, poultry, reptiles or insects of any kind shall be kept on any site. No dangerous, aggressive or poisonous pets of any kind are permitted. Management reserves the right to reject any pet. All pets must be registered with the office and vaccination records must be available upon request. All pets must wear a collar identifying the owner and phone number. All pets must be on a leash at all times. No pet shall be left tied or otherwise unattended at any time. Pet owners must clean up after their pets, including all pet excrement. Any person bringing or keeping a pet on a site shall be solely responsible for the conduct of their pet. No fences or playpens are allowed. Pets are not permitted in the public buildings or amenity areas, including but not limited to the bathrooms, club house, swimming pool and beach areas. No pets are allowed when Tent camping. Pets should not be an annoyance (barking continually), or danger to the other occupants or visitors of the Resort. The Resort shall have no liability to family members or guests for any damage or injury to persons or property caused by any pet. Pool/Spa Pool hours are 8 a.m. to dusk per our operating permit. There is no lifeguard on duty. Guests must be at least 13 years of age or accompanied by a parent or guardian to enter the pool area. Children not yet potty trained are required to wear a swim diaper. While in the pool area, all posted rules must be observed. Proper conduct and bathing attire is expected. Glass containers, personal musical devices and smoking are prohibited in the pool area. No eating or drinking is allowed within 3 feet of the pool. Marina/Watercraft All watercraft must be registered and appropriately identified with Resort registration stickers for both boat and trailer. All vessels must be registered and insured as required by the State of Florida. Dock access is restricted to slip holders and their guests only. No swimming or fishing in the Marina. Please see Marina office for registration details and marina rules. Boat Washing Washing of boats on campsites is prohibited. Watercraft motors may not be started or flushed at sites; these actions are restricted to the Marina area. See the Marina office for details. Grills/Open Fires Monroe County Law prohibits open fires on the ground. Fires must be in a raised container with an ember screen in place. Small residential grills are permitted on site and must be attended at all times. Please check with the office for any additional restrictions based on weather conditions. Laundry Washers and dryers are available in the laundry room. Machines operate by credit card. Washers and dryers are allowed within the RV only (not within the shed or cargo trailer). See front desk for operating hours. Garbage/Recycling The Resort shall provide a location for guests to dispose of common household trash/recycling and guests shall place such trash/recycling only in containers provided by the Resort. Guests shall not allow waste or trash to accumulate on their site. Guests shall be responsible for waste or trash removal in excess of common household trash. No Permanent Residence Guests shall use their RV and site for recreational purposes only and shall not use their RV and site as a permanent residence. No guest may physically occupy a site for longer than six (6) months per annum (per Florida Statutes, Chapter 513). All guests must have a permanent residence other than their RV and site. Proof of guests’ permanent residence may be required. Guests may not use the Resort as their physical address (e.g., may not use for driver’s license, permanent mail, etc.). Mail forwarded to the Resort on a temporary basis is permitted, however mail received by the Resort more than one (1) month after reservation completion will be discarded. RV Requirements Guests must maintain their RV and site at their expense in such a manner as to prevent them from becoming unsightly, unsanitary, a hazard to health, reasonably uninhabitable, deteriorated, dilapidated or infested with rodents, vermin, insects or other pests. Guest’s must ensure that the RV be road worthy at all times with valid/current registration and carry liability insurance for his/her vehicle as required by the State of Florida. Vacating Site When a guest with a transient or seasonal reservation vacates a site for any reason (including but not limited to reservation completion, inclement weather, county enforced mandatory evacuation, etc. ), the reserved site must be entirely cleared. This includes, but is not limited to removal of: RV, vehicles (including golf cart), canopy, watercraft, cargo trailer or shed, refrigerator or freezer, outdoor furniture, décor, carpet, flooring and stairs. All utilities must be disengaged and secured, and sewer must be left capped. Any item left behind will be disposed of by Resort authorized personnel. Guests with an annual lease when vacating for six (6) month period may leave their single RV and storage shed. All other materials including but not limited to vehicles (including golf cart), canopy, watercraft, refrigerator or freezer, carpet, flooring, stairs, outdoor furniture, materials beneath RV and decor must be removed or secured within the RV or shed/ cargo trailer. Sewers must be disconnected from RV and capped. Any utilities left connected may be detached in case of emergency or at the sole discretion of Management. In the event of a county mandated evacuation the guest should make every effort to remove all materials including the RV and shed from the Resort. Any item left behind (other than RV and shed/cargo trailer) will be disposed of by Resort authorized personnel. Business Activities No business or commercial activities of any kind whatsoever shall be carried out or conducted upon any site, without the prior written approval of the Resort Management, which may be withheld by Resort Management in its sole discretion. Noxious Activities No illegal, noxious or offensive activities shall be conducted at any site, nor shall anything be done within the Resort which is or could become an unreasonable annoyance or nuisance to neighboring sites. Without limiting the foregoing, no guest shall permit noise, including but not limited to barking dogs, operating excessively noisy air conditioners, stereo amplifier systems, television systems, motor vehicles or power tools that would unreasonably disturb guests at other sites. Smoking is prohibited in any public building, including restrooms and the pool area. Smoking material must be extinguished in an appropriate fire container. The use or possession of illegal drugs or alcoholic beverages shall be in compliance with applicable Federal laws. Disorderly Persons The following are grounds for reservation termination and removal from the Resort: loud noise, whether mechanical, musical or vocal, use of foul or indecent language, causing damage to property of the Resort or another person, drunken disorderly conduct, failing to follow these Rules, failing to follow directions of the Resort staff, threatening or abusive behavior or any other conduct that is not the type of behavior that is expected in a family Resort. Damage The Guest is responsible for all damage or destruction of property, and any injury to persons, caused by the guest or his or her family, visitor or pets. The Resort reserves the right to charge guests accordingly for any damage they cause to the grounds and/or Resort facilities, including but not limited to broken waterlines, damaged/missing sewer connections, cable lines, landscaping, and excessive debris (bottle caps, zip ties, cigarette butts, etc.). Amendment of Rules The Resort reserves the right to amend, delete, revise and/or add additional Rules in its sole discretion. Guests must comply with Resort Management’s directives at all times, whether in addition or contrast to these rules. The Resort reserves the right to refuse service and will not be responsible for damage to rigs, accidents or injury to guests or loss of money, jewelry, or valuables of any kind. Violation of any of the provisions contained herein is grounds for removal from the Resort at the sole discretion of Resort Management. 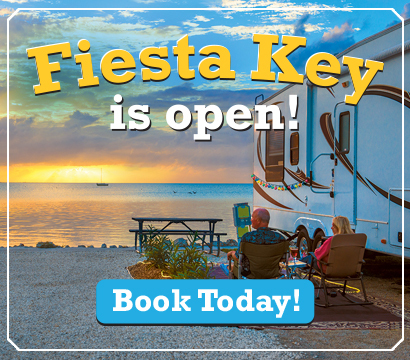 Please note: Fiesta Key RV Resort & Marina is an age qualified resort (55+) and does not allow reservations with children.